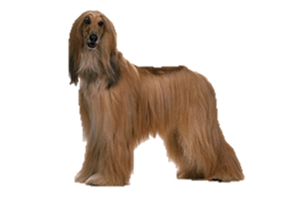 The elegant Afghan Hound has become a popular dog in the show ring, its long flowing coat a trademark. However, don’t let their elegance fool you. Bred as a working sighthound the Afghan Hound is capable of taking down a wide variety of prey. This includes hare, fox, deer, gazelle, jackal, wolf and even snow leopard. As a secondary role they acted as guardian of property and livestock. Although only one variety of Afghan Hound is recognized in the show world, in their homeland there are over a dozen different types of Afghans. The Afghan Hound originated in the Sinai Peninsula and later moved into Afghanistan. In its native lands they are known as the Tazi and traditionally were prohibited to be taken outside of the country. They are considered among the oldest breeds and estimates of their age have been anywhere from 2,000 - 6,000 years. Legend even states that it was the Afghan Hound that Noah took on the ark, so that all other dogs would stem from this one source. Whether truth can be held in this tale or not recent DNA testing shows that this breed is indeed one of the oldest surviving breeds today. Out of 85 American Kennel Club breeds that were used in the DNA study the Afghan Hound was included in the 14 closest in relation to the wolf. The Saluki was also in this same grouping, another sighthound traditionally thought to be a close relative. Some suggest the Saluki is actually the older of the two. Is the Afghan Hound Right for You?